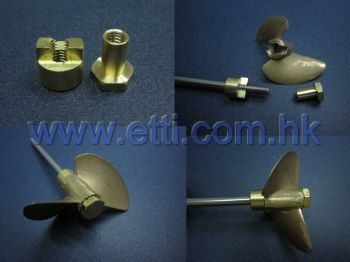 Etti 4mm to 3/16"(4.75mm) prop adapter. This is used if you are trying to adapt a 3/16"(4.75mm) propeller to a 4mm threaded shaft. The threaded drive dog is first threaded onto your 4mm threaded shaft. Slide your propeller onto your shaft. Then install and tighten the included adapter/propeller nut. Keep in mind, you need enough threads on your shaft to fit the prop hub you are trying to adapt.